The recent rediscovery of what is perhaps the most iconic and the world’s largest wild bee species, endemic from just a handful islands in Indonesia, represents a major finding and opens up new avenues for conservation research on this species thought to be extinct. 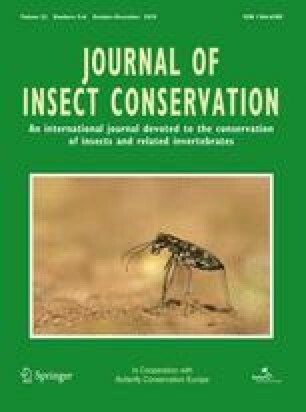 But there is one twist in this otherwise positive insect conservation tale: two female specimens of Megachile pluto collected on Bacan (Indonesia) in February and on Halmahera (Indonesia) in September 2018 (respectively) appeared on an international online auction site, and fetched several thousands of US$ each to private collectors. These online sales marks a new chapter in bee conservation, and will likely present important new policy and scientific challenges to protect this species from extinction. Indeed, while Wallace’s Giant Bee is currently red listed according to the International Union for Conservation of Nature, the international trade of this species is currently not restricted as it does not appear on the appendices of the Convention on International Trade in Endangered Species. Wider implications are discussed to highlight how the case study of Wallace’s Giant Bee also applies to other threatened insect species subject to international trade, and how conservation actions should be developed. I am grateful to Frederique Bakker, Leon Marshall and Koos Biesmeijer (Naturalis, The Netherlands) for allowing access to the specimens of Megachile pluto curated in Leiden, and also to Clay Bolt (World Wildlife Fund’s Northern Great Plains Program), Eli Wyman (American Museum of Natural History, New York, USA) and Roch Desmier de Chenon (CSIRO) for fruitful discussions during the preparation of this manuscript. Finally, I acknowledge the constructive comments of anonymous referees of a previous version that helped improve the quality of this paper. I declare no financial or non-financial conflict of interest.